Convenient kiosks allow residents to renew car registrations while shopping for groceries. Georgia Department of Revenue is expanding their MVD kiosk program with grand openings scheduled for this week in five new locations. The kiosk program has proven to be widely popular with Georgia residents, already doubling in size in 2017. Much of this growth is due to placing kiosks in conveniently located Kroger stores, allowing citizens 24/7 access to renew Georgia vehicle registrations. Carroll County Kroger #367, 1355 South Park St., U.S. HWY 27, Carrollton, 30117. Grand Opening Dec. 6th. The Georgia motor vehicle kiosks, provided by Intellectual Technology, Inc., allow county residents to conduct their vehicle registration business on their own schedule. By placing self-service kiosks in convenient Kroger locations that are open extended hours, Georgia vehicle owners can now renew registrations while purchasing a gallon of milk. Kiosks are easy to use, and registrations can be renewed in as little as 2 minutes. Simply scan your driver’s license, swipe your credit card, and then print your registration and decal. Georgia Motor Vehicle kiosks accept payments by credit or debit card. Instructions and voice prompts are in available in English or Spanish, making the kiosks as easy to use as an ATM. 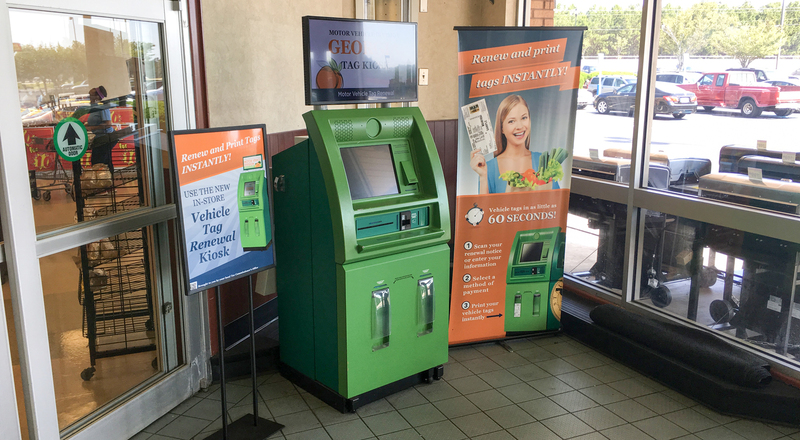 The Georgia motor vehicle registration renewal kiosks are located at select Kroger stores and County Tag Offices. There are now 24 Georgia counties participating in this program. Residents of a participating county can use any kiosk in Georgia, even those in other counties. For a complete listing of all participating Georgia counties along with kiosk locations, visit https://dor.georgia.gov/mvd-self-service-tag-kiosk. Intellectual Technology Inc. (ITI) specializes in DMV kiosks that help motor vehicle agencies throughout North America increase speed, visibility and security of motor vehicle transactions. ITI is the industry leader in DMV kiosk technology with programs in 11 states. Whether services are delivered in DMV offices, mail fulfillment centers, or Self-Service Kiosks, ITI’s DMV on Demand software provides motor vehicle agencies the ability to service customers wherever they are located.